We know, we know… the blog has been a bit slow lately, as we’ve been busy with other tasks. In the meantime, here’s a brilliant giveaway to make up for it — enjoy! If so, you’ve probably heard about Papersisters! Although the company only started a couple of years ago, its eye-catching designs have swiftly conquered the hearts of many postcrossers around the world. Sisters Wiebke (aka Namibia13) and Maike (aka jofemapa) are both enthusiastic postcrossers, and this passion turned into the creation of postcards and the opening of their own shop. Their range includes nicely illustrated postcards about different regions of Germany and their typical things, the country series featured above, stamp collages (my favorite! ), and others for special occasions. They also do cute Postcard IDs or weather-themed rubberstamps to personalize your cards, as well as a few other goodies! And now, for the best part! 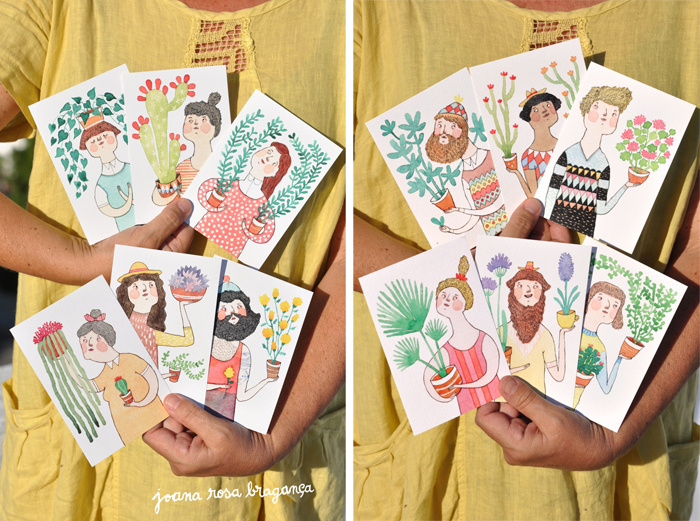 Papersisters is offering a pack of 12 postcards to 4 lucky postcrossers, plus one rubberstamp prize for an extra winner! Pretty cool, right? For a chance to receive one of these prizes, visit their website and leave a comment below, telling us which postcard (or series of postcards) is your absolute favorite! Good luck everyone! Don’t forget to check back here next Saturday for the winners (randomly picked by Paulo’s number generator, as always). And the winners of this giveaway, as chosen by Paulo’s random number generator are… amandam718, tandrj, Tufta, Allison_b216 and svoboda999! Congratulations — and thank you everyone for your enthusiastic participation on this giveaway! We first saw Kehvola's cards on a pop-up postcard fair organised by the Finnish Postcrossing Friends Association in Tampere, and I confess I was instantly smitten! It’s no secret I have a sweet spot for illustration, but their playful style and daring colour palette was what got me hooked. At the time, I sent the postcard on the right to a booklover friend, and stocked on others… though I’ve been very reluctant to part with them! At the time, we talked a bit with the owners, Veera and Timo, who were staffing their booth at the fair, and Timo agreed to answer a few questions for the blog. So ladies and gentlemen, here he is to tell us more about Kehvola! How did Kehvola get started? Could you tell us a bit of the story behind it? Veera (my wife) had previously worked as a store manager in the Finnish National Gallery’s museum shops. There she noticed that there are no nice Helsinki cards available. She started the company and asked the nearest and the cheapest illustrator (me!) to draw a set of Helsinki postcards. This was just four years ago. 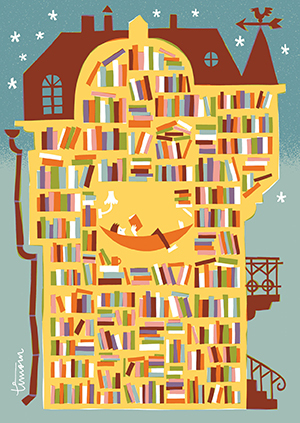 We’re fascinated by how coherent your collection is — despite being illustrated by different people. 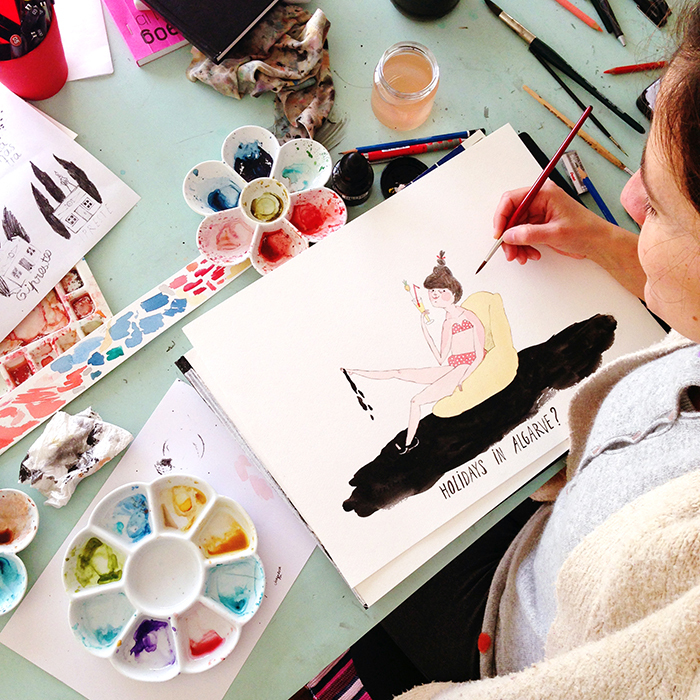 How did this group of illustrators get together? And how do you choose the themes for your pieces? We are illustration fans and we’ve been very lucky with our artists. So far everybody we’ve asked to join us had said yes. I think our illustrators all have something in common yet they all have their own distinct style. Our illustrators have all illustrated children’s books and are capable of creating narrative pictures with strong sense of atmosphere. Illustrators are free to offer their own ideas but most of them prefer clear orders from us. I myself think what I would like to draw (this could be an old bike or a rubber boot, a big bookshelves, elvis, tiger or an apple pie) and then consider with Veera would somebody be interested in such a card. If we like the idea enough we print it anyway. If you could define Kehvola’s style in 3 words, what would they be? Are you letter or postcard writers too? Always when travelling. I love bookshops and museum shops and browsing through their postcard selection. Writing a postcards in a cosy pub or cafe after a long day of walking is an essential part of my traveling. 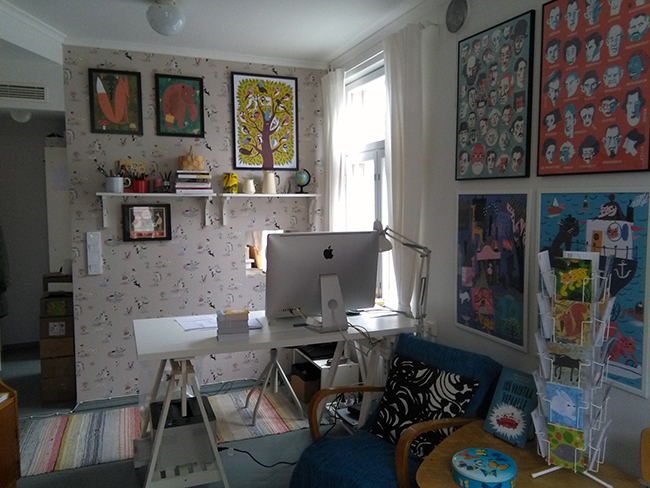 Could you show us your studio, or the place where the magic happens? Thank you Timo, that was lovely! Besides their shop, you can also find Kehvola on their Instagram and Facebook pages. Run by professional photographer Arnold Voordewind, Natuurlijkefoto specialises in nature photos, including animals and landscapes, with special emphasis on the Dutch ones. His photos are stunning, so it’s no surprise that the postcards are such high quality and so sought after! Fantastic, right? 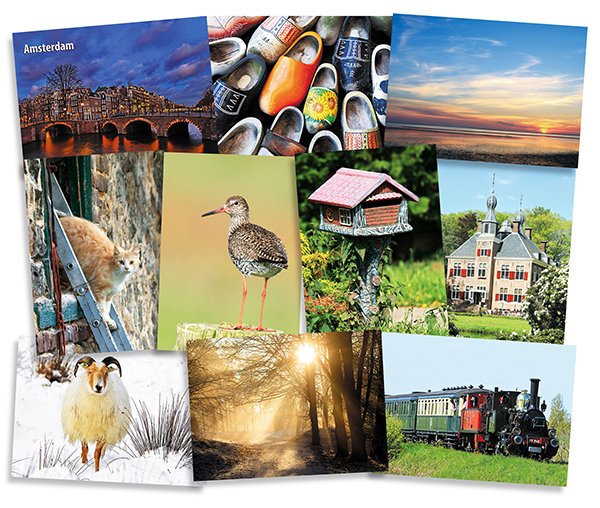 For a chance to win one of these sets of postcards, visit Natuurlijkefoto.nl's website and leave a comment below, telling us which series of postcards is your favourite! 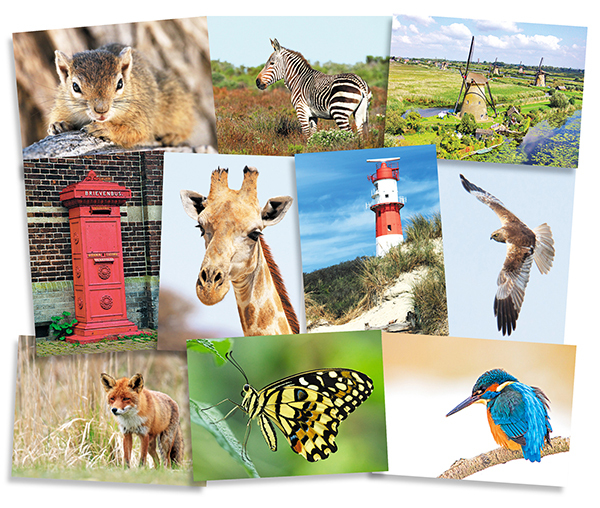 From animals to mailboxes, boats to lighthouses, we’re sure there’s something you’ll find exciting there! Good luck everyone! Check back on this post next saturday for the winners (randomly picked by Paulo’s number generator, like always). 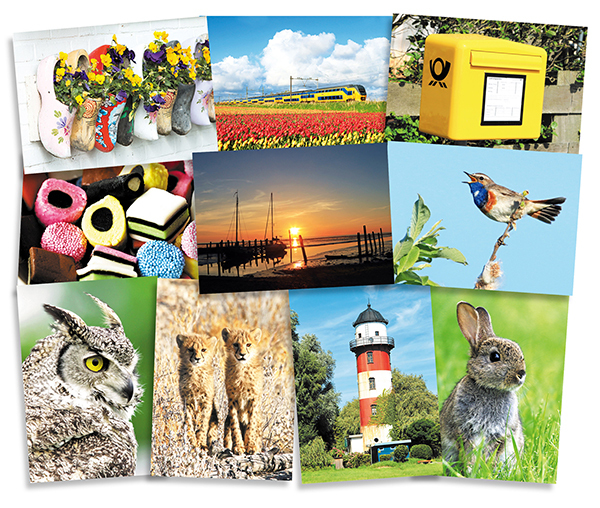 PS – Until July 8th, Natuurlijkefoto is also offering a 20% discount on all orders above €20. Use the discount code “weekendgiveaway” during checkout to claim that offer. Every few years, we make a new roundup of postcard sets that have shown up online. The offer is usually interesting, good quality, affordable and perfect to introduce a bit more variety to anyone’s stash. The last time we did this was in 2014, so let’s see what is new since then! 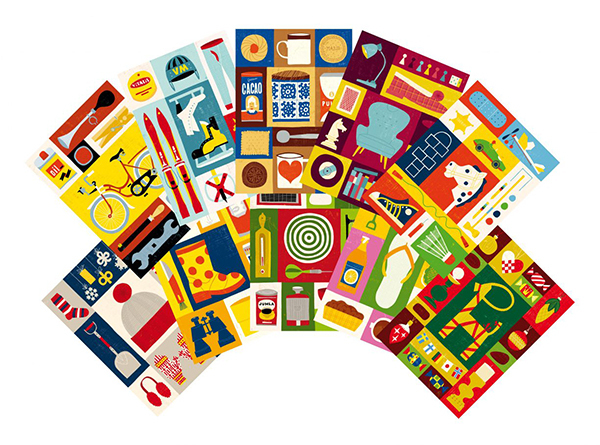 Personally, we have the Cookery postcard box and I can’t wait to check out the Curious Feast… I bet you can spot the pattern there! :) But there’s something for everyone — from biking to design, animals or flags, so do check them out when you need some extra cards. And if you have any tips of postcard boxes you think postcrossers would enjoy, let everyone know in the comments! Living in a touristic area can be a bit challenging. While postcards are easy enough to find, they’re usually über-touristy, featuring the beaches and little else. It gets boring after a while… which is why I was delighted to discover Rosa’s postcards on our way back from a trip to the market in Olhão. Turns out, her mom has a little store by the waterfront that showcases local art and products — including Rosa’s gorgeous postcards and art. Could you introduce yourself briefly? I’m Joana Rosa Bragança (but you can call me just Rosa!) 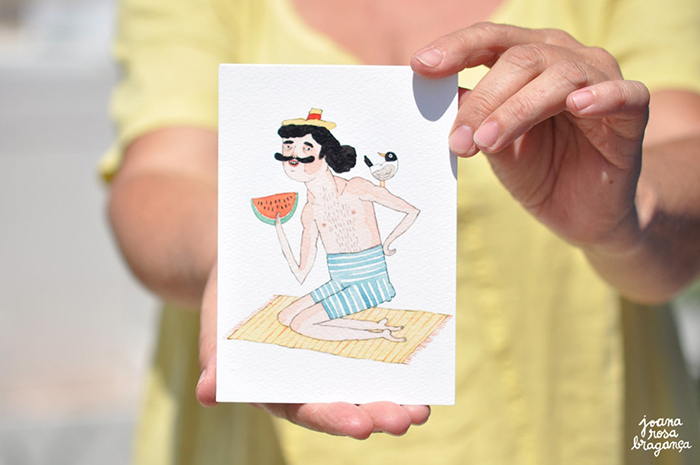 and I’m an artist & illustrator based in Olhão, a fishing town in the Algarve region. I love living near the sea! Besides drawing and painting, I also like to spend my time photographing with film cameras, walking in nature, reading, sewing and trying cake recipes. I love mornings, cats, artisanal ice creams, fresh figs and old books. I get a lot of inspiration from the people I see, not only the people of my hometown, with their strong characters and looks, but also the foreigners who pass by, who are a lot these days. One of my favorite themes is the beach and bathers, and here I have plenty of “models” to observe! Still, not all my characters are inspired by real people, some of them happen to be really bizarre and come directly from my imagination. I also love to draw all sorts of animals and plants. Are you a postcard or letter writer yourself? I used to be, I even had pen friends when I was a teenager… then the internet appeared and made me forget it a little. Nevertheless, I love sending the orders of my online shop inside envelopes full of doodles and postage stamps. Postage stamps are awesome! My favorites are the ones with illustrations or photos of fauna and flora. If you could define your style in 3 words, what would they be? 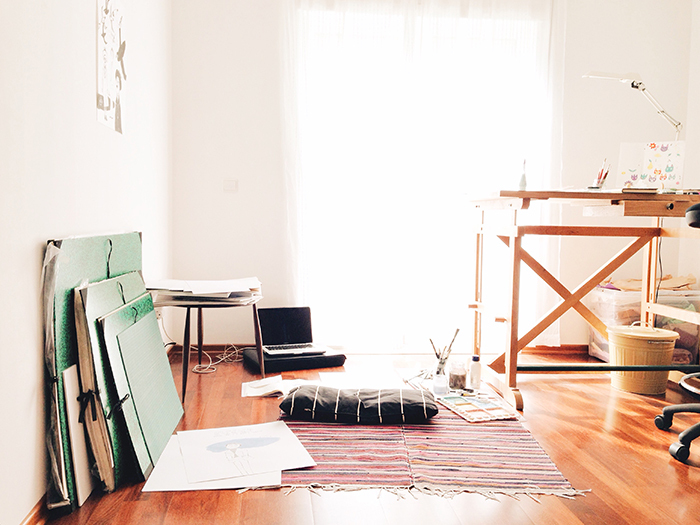 And could you show us your workspace, the place where magic happens? Thank you so much, Rosa! You can check these and other postcards and art on her online shop. And if you know of other stationery makers we should check out, let us know in the comments!